Ye Olde Rose and Crown Theatre have built up a solid reputation over the past two years for staging revivals of rare theatrical productions and UK premieres, and today they open a production which offers a very different perspective of what has become one of the most well-known love stories in the world of musical theatre. In 1991, the award winning musical team of Maury Yeston and Arthur Kopit, whose earlier collaboration on Nine won them a Tony Award for Best New Musical, presented the world premiere of their brand new musical in Houston, Texas, simply named Phantom. Their musical adaption of Gaston Leroux’s novel The Phantom of the Opera has since been performed all around America (although not on Broadway) and even in Australia, but now it is to make its UK debut courtesy of Ye Olde Rose and Crown Theatre’s resident company, All Star Productions. The musical opens tonight (14th May 2013) and runs through to the end of the month, with Kieran Brown and Kira Morsley starring as the infamous Phantom and his singing muse Christine Daae. 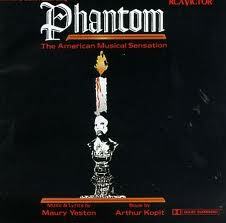 This alternative take on the classic story by Yeston (Music & Lyrics) and Kopit (Book) begins at the time when Erik (The Phantom) first meets Christine and gives the audience a deeper insight into the mysterious Phantom and makes more of the relationship between him and the head of the Opera House, Gerard Carriere. Andrew Lloyd Webber’s 1986 production is widely regarded as the definitive version of The Phantom of the Opera. It is the most successful musical in the history of musical theatre and is still one of the West End’s most popular shows after 26 years, with a dedicated world-wide fan base. It was even made into a film in 2004, starring Gerard Butler and Emmy Rossum. Lloyd Webber’s musical is only one of many varying adaptions of the original 1910 novel though, and his stage production was in fact preceded by Ken Hill, who presented the first ever musical version at the Theatre Royal Stratford East in 1976. Also coming before Lloyd Webber’s production was the 1925 silent film starring Lon Chaney, and the 1943 film which starred Claude Raines. Then there is the range of Phantom literature which has been published, such as Susan Kay’s Phantom, Frederick Forsythe’s The Phantom of Manhattan and An Wallace’s Letters to Erik: The Ghost’s Love Story, to name but a few. Andrew Lloyd Webber’s stage musical has become so beloved by theatre fans though that, as the ‘definitive version’, other versions are often not accepted by them. There are websites dedicated to tearing apart the plots and character portrayals of these novels, productions and so forth, and ‘Phans’ of the 1986 musical have sometimes taken their love of it to extreme measures. Following the presentation of Lloyd Webber’s The Phantom of the Opera sequel, Love Never Dies, at the Adelphi Theatre in 2010, some fans hated the direction that the continued story took so much that an online community under the name of Love Should Die sprung up to protest the show and call for its closure, as well as actively attempting to discourage people from seeing it. There are some who will probably despise the Maury/Kopit production because it doesn’t follow the ‘accepted’ story that Lloyd Webber conceived and features a very different score to what they know. There’s no ‘Music of the Night’ or ‘All I Ask of You’ to be heard here – indeed there isn’t even a Raoul in this musical. The Phantom’s rival for Christine’s affections here is Count Philippe de Chandon. What it does have though is a passionate story of murder, romance and intrigue which remains loyal to Leroux’s novel, and a sensational score featuring some epic musical numbers, such as ‘Where In The World’, ‘You Are Music’, ‘You Are My Own’ and ‘Who Ever Could Have Dreamed Up You?’ I’ve heard the show’s leading man and lady perform the beautiful duet ‘Home’, and Brown and Morsley’s stunning rendition delivers a sumptuous taste of what to expect from this production. Appearing alongside Kieran Brown and Kira Morsley as The Phantom and Christine are Sean Paul Jenkinson (Philippe), Pippa Winslow (Carlotta), Tom Murphy (Gerard Carriere), Andrew G Rivera (Cholet), Elizabeth Atkinson (Belladova), Thomas Hewitt (Inspector Ledoux), Emily Apps (Flora), Gregory Hazel (Minister of Culture), Harriet Payne (Fleur), David Jay Douglas (Young Carriere), Rebecca Westberry (Florence), Mark Byles (Buquet) and Matthew James Willis (Jean Calude). This company of performers have an exciting task ahead of them as they get to show audiences another side to the story of The Phantom. There are a million differences between Phantom and The Phantom of the Opera, including The Phantom’s mask, the ‘mystery’ surrounding his origins and, not giving anything away, the final outcome for him in the musical’s ending. All of these things and more may be a problem for some Phantom fans, but as a long-standing fan myself, I couldn’t be any more welcoming of this production. I’ve written here on many occasion about how Andrew Lloyd’s Phantom is my favourite musical theatre show, but I find it interesting to look at those other variations of the story that exist out there and discover something new about this character and his story with every experience. When it comes to The Phantom of the Opera, I don’t think there is a right or wrong way to tell his story, and I certainly don’t presume to have a claim on the characters and dictate to anyone involved in creating a Phantom story how they should portray them. After all, if Yeston and Kopit’s musical had made it to the stage first, perhaps it would be Lloyd Webber’s version which would have been overshadowed. Phantom at Ye Olde Rose and Crown Theatre is a musical that any theatre fan should try and see; especially if you are a fan of The Phantom of the Opera. Theatre is all about creativity and imagination, and the opportunity to experience what Yeston once referred to as “the greatest hit never to be produced on Broadway” and see the Phantom story in a whole new light is one not to be missed.